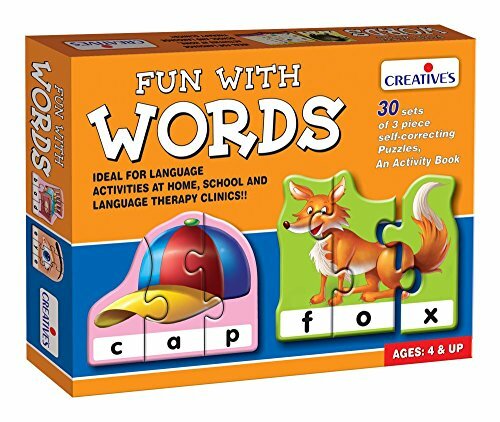 “Fun with Words” is a set of 30 self-correcting three piece word building puzzles, a 24 pages Activity Book and an Activity Guide. Children build 3-letter words by assembling beautifully illustrated pictures of objects relating to child’s immediate environment. 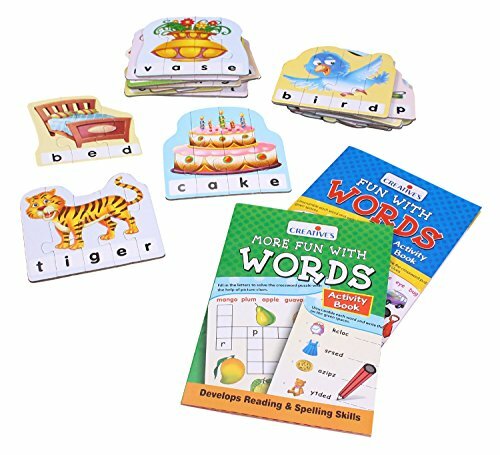 As the child sort and join the correct pieces together to complete the pictures and spell the words he/she recognizes letters, learns spelling and build vocabulary. With the help of the Activity Book and suggestions given in the Activity Guide the child will be able to further practice many new words and strengthen spelling to improve concentration, observation and visual discrimination skills. 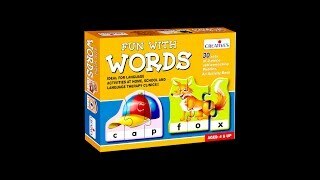 “Fun with Words” is a set of 30 self-correcting three piece word building puzzles, a 24 pages Activity Book and an Activity Guide. Children build 3-letter words by assembling beautifully illustrated pictures of objects relating to child’s immediate environment. As the child sort and join the correct pieces together to complete the pictures and spell the words he/she recognizes letters, learns spelling and build vocabulary. With the help of the Activity Book and suggestions given in the Activity Guide the child will be able to further practice many new words and strengthen spelling to improve concentration, observation and visual discrimination skills.